OTT delivery represents a huge opportunity and broadcasters need to fill the ad avails in real time. While viewers shift their focus from traditional linear TV broadcast to online viewing, the OTT space is growing rapidly. The Accenture report “The Future of Broadcasting V” claims that “TV viewing on traditional platforms is declining at an accelerated pace,” while OTT and IPTV viewing is on the rise. An ABI Research report published in January predicted that live-linear OTT services alone would grow to about $7 billion in global revenue by 2021, up from about $1 billion in 2016. Clearly, there is an opportunity in the OTT market for traditional broadcasters to attract new audiences and retain the cord-cutting users they might otherwise lose. In fact, to stay competitive, many traditional TV networks are adding OTT and video-on-demand extensions to their linear channels. While some are delivering their content via their own OTT platforms, others have sought third-party OTT content-aggregation platforms. Interestingly, broadcasters aren’t the only ones turning to OTT. The technology is popular with advertisers, too. The fact that OTT platforms enable targeted and personalized advertising has led many advertisers to shift a good portion of their advertising dollars from traditional TV to OTT. The prospect of delivering a mid-roll video ad in live linear content, to the right audience at the right time, is indeed tantalizing, albeit full of technical challenges. On the technical front, monetizing content and personalizing ads is complicated and presents multiple challenges for OTT content aggregators. For one, aggregators need to deploy the right CDN strategy in order to deliver content across geographies. They also must meet the integration requirements of various ad networks in the ecosystem. These factors alone are challenging, but when it comes to ad insertion, there are other complications — such as the fact that aggregated channels might not have standard break durations, and OTT aggregators have little or no control over the ad triggers. Therein lies the biggest challenge for OTT aggregators: In the absence of ad markers in the incoming broadcast feeds, it’s almost impossible to know where to insert a personalized ad within any given stream. In a perfect world, the TV networks would supply ad markers to indicate where ad spots exist in the stream so that aggregators can replace them with personalized ads before distributing, but many networks don’t do that. As a result, it’s up to the aggregators to detect ad avails in incoming streams and insert personalized ads for targeted reach. If aggregators can’t detect the ad avails, then they can’t monetize their premium ad inventory. The way to resolve those business challenges is through machine-learning-based automated ad-detection technology, now possible using cloud platforms. Through such platforms, OTT aggregators can automatically identify ads avails in live feeds and replace them with dynamically inserted personalized ads on the server side — all in real time. An ad-mining module within an automated ad-detection platform receives broadcast feeds from channels and studies each video segment. As content comes in, it flows through an ad finder engine, which uses machine-learning techniques to identify ad segments. Each segment is then assigned a unique signature that is stored in a secure signature library. 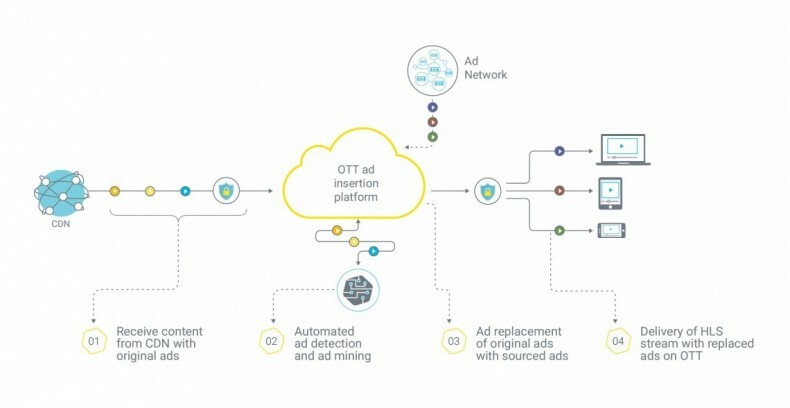 An automated OTT ad finder engine uses machine-learning techniques to identify ad segments and then fetch the proper advertisement from the appropriate ad exchange server. When the aggregated feeds pass through a dynamic ad-insertion server, each video segment gets compared with the ad signatures library. As and when the signatures match, the system begins replacing the avails with personalized ads. These ads are dynamically fetched from a network of ad exchange servers in real time based on user preferences, and stitched on the server side to create a unified stream of content and ads. This video stream is then delivered to user devices. One of the advantages of server-side ad insertion is that aggregators can completely avoid any ad-blocker apps installed on the end user’s device. If the ad is part of the content stream, it creates better value for the advertiser, unlike the scenario where the users skip ads. Furthermore, it creates a smoother, cleaner viewing experience for the audience without the buffering that is typical of client-side ad insertion. In order for an automated ad-detection approach to realize its potential, integration with all leading ad networks is important. Partnering with leading ad networks such as SpotXchange, Google Double Click, YuMe, and Sizmek, among others, will ensure optimum fulfilment of ad inventory. For one, it eliminates the aggregator’s dependence on broadcasters to supply ad markers. Being able to detect and replace ads in real time over live linear streams without additional input from the broadcaster improves an OTT aggregator’s ability to effectively monetize multiple streams. Automated ad detection also allows OTT aggregators to create new sources of ad revenue instead of forgoing ad avail opportunities. Without auto ad detection or even ad-replacement options for OTT platforms, an aggregator’s revenue stream would depend solely on subscriptions. But with ad detection, not only can OTT platform providers gain income from subscriptions, but they can also attract new advertisers and gain revenue from the ads. Automated ad-detection technology requires limited investment in terms of capital or resources on the part of OTT aggregators, making implementation relatively quick and simple. Once the platform is in place, any new feeds the aggregator adds to its bouquet can be quickly monetized. The speed and effectiveness of deployment could depend on a number of factors, such as whether the chosen platform has built-in scalability, the level of integration, and the quality of assistance with finding the right set of ad networks. A platform that offers additional flexibility with a programmatic approach is ideal to improve monetization value. OTT aggregators can make the most of every monetization opportunity — thereby creating better value for themselves and for advertisers, and in turn providing a superior, engaging, and personalized experience to the audience. Ultimately, they’ll be better equipped to satisfy broadcasters, advertisers, and subscribers, and in so doing, ensure the long-term viability of their platform in a competitive OTT marketplace. K.A. 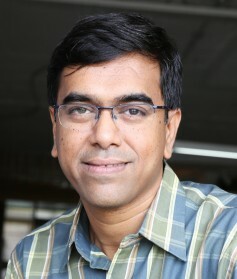 Srinivasan is the co-founder of Amagi. If I have an Ad Blocker app using the same technology then obviously I can block your ads. Super Bowl LI will stream live online for free but with insertion of local ads for the first time. The ads will be dynamically inserted based on where a viewer is watching the NFL’s championship contest.